This will be mostly photos. 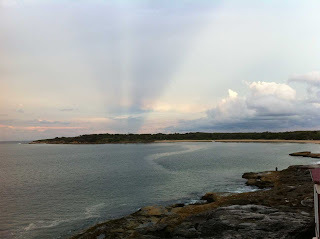 Maybe a little self-indulgent but I really love this place and just want to share it with you. Staying in a wonderful house with views and a large deck overlooking the bay, it was difficult not to feel I was in paradise. Two visitors who were my constant companions were the young Kooka, and a Seagull with no feet. This little guy balances on the deck rail, en pointe, swivelling in the strong winds and hunting off any other seagulls with aplomb. 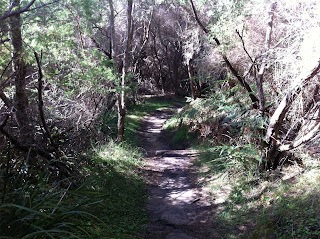 Walking in the Royal National Park, wherein Bundeena sits, is a delight and a privilege. 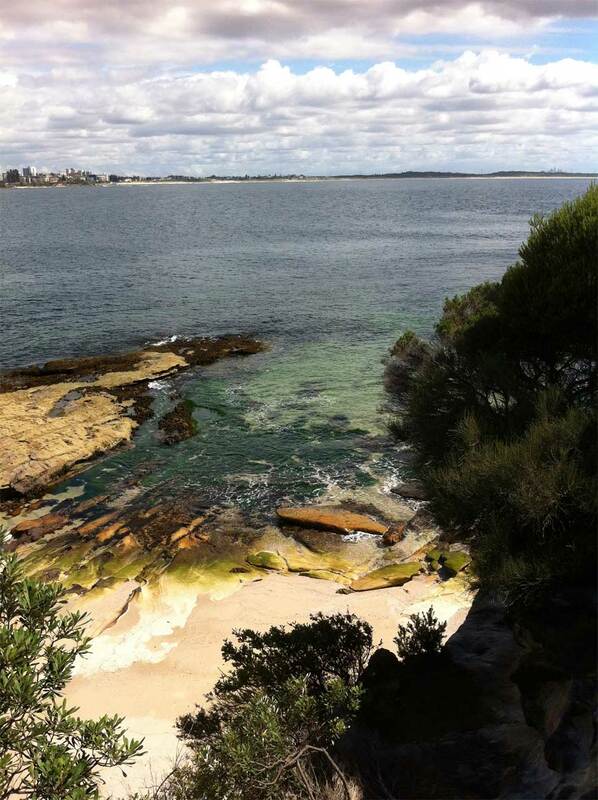 Wild coastal scrub, Aboriginal rock carvings, magnificent rocky cliffs, native flowers and trees, animal scats and tracks - and all this with the sun shining mightily each and every day. 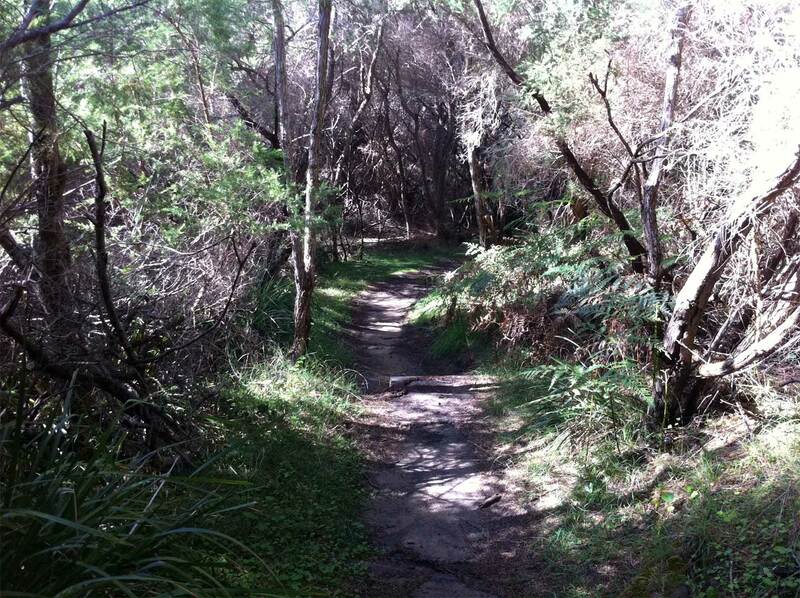 A cool path between ti-tree scrub. A snaky place but if we grow up in the bush here in Australia we know to keep an eye out for the snake snoozing in the sun. The view from Bundeena Head. 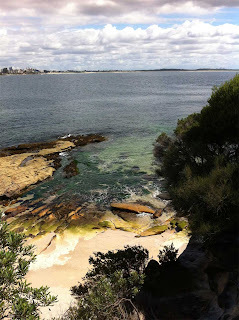 Golden sand, Sydney Sandstone rock faces, pristine waters. Aboriginal rock carvings are on a huge flat rock face, not obvious to the passer-by, but a very thrilling experience when they are found. 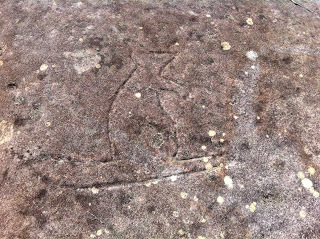 This is a Swamp Wallaby but there are also rays, whales, spirit figures, and the ubiquitous initials carved by idiots who think they are entitled to add to the art of our First People. 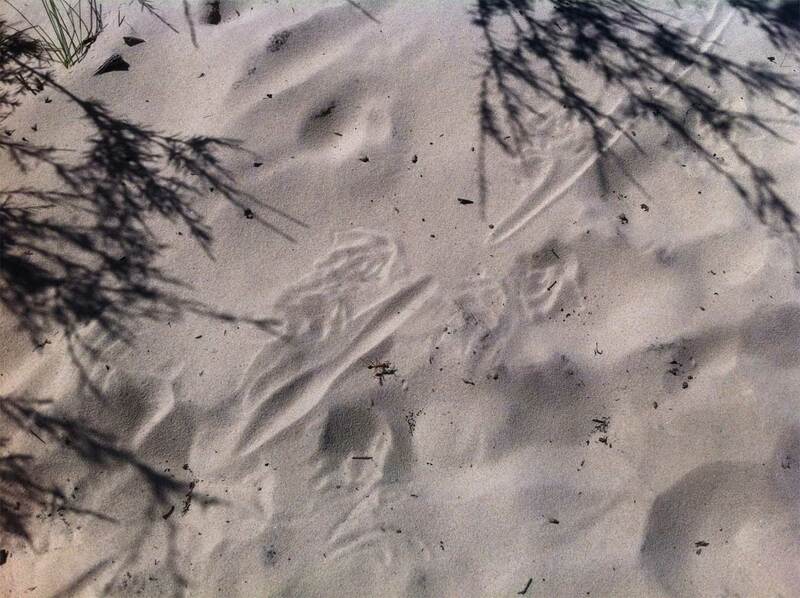 On a sandy track there were signs of a wallaby crossing. The tail marks have footprints on either side. I love knowing that not only are there birds everywhere but mammals and reptiles are also close by, possibly watching me as I peer into the undergrowth, hoping to see them. 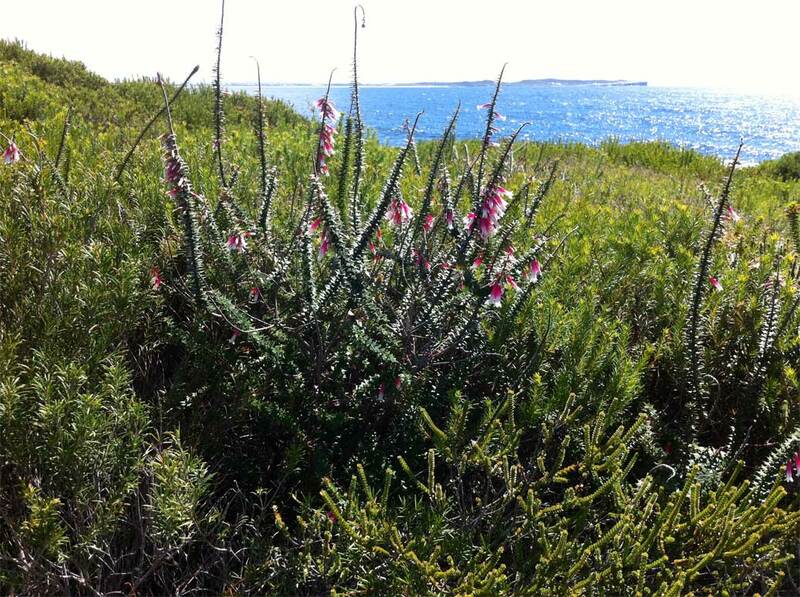 This is an Erica, known as Swamp Fuschia. 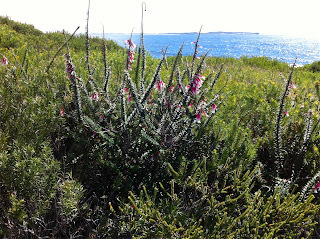 This is very typical Coastal Scrub, a great place for small birds. Looking east from the deck this was a reflection of the sun setting in the west. 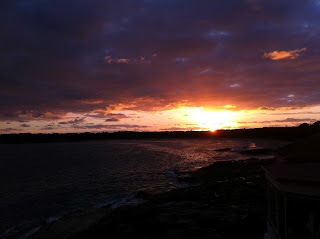 Here is the sunrise breaking through, followed by the stunning full sunrise. I couldn't stay in bed once I saw it was nearly dawn and I have to admit that I did take a lot of photos early in the morning. 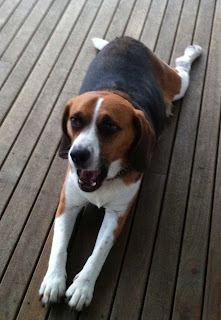 Basil of course was there, my beautiful GrandPup, friend of Kookas and seagulls. 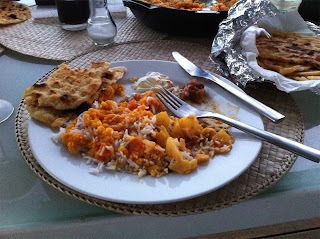 Tracy produced a wonderful vegetarian curry and it was lovely to sit out on the deck, eating in the gloaming. 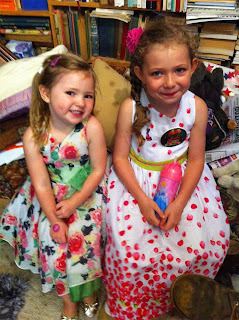 Eddie made it into my last post so here's Cilla and Fia, in their new birthday dresses. Fia is just six and Cilla will be four in April. Her dress came early. One last snap of natural history. 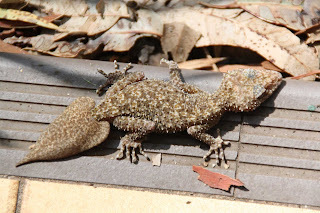 A Leaf tailed Gecko sheltering from the rain. When I picked him up to take him to safety he hissed quite fiercely and tried to bite me. I do like lizards so much. My friend Jen, also fond of lizards, isn't feeling so charitable just now. A huge Goanna or Lace Monitor has visited her house this week, which she didn't mind, but she did mind that he also visited her chooks, killed a chicken and ate all the eggs. Before I go, I must thank Amanda for the very welcome gift that landed in my mail box this week. I won't show what it is until I know Amanda has written about it on her blog. Thank you, Amanda, a very cool gift. How wonderful. Thank you so much. These photos are just stunning. EC, you are so kind. I think these were all taken on my iPhone. The previous lot were on the iPad, which has an inferior camera. My big Canon is great but when it comes to lugging it around on rough ground, I just can't go beyond the iPhone. 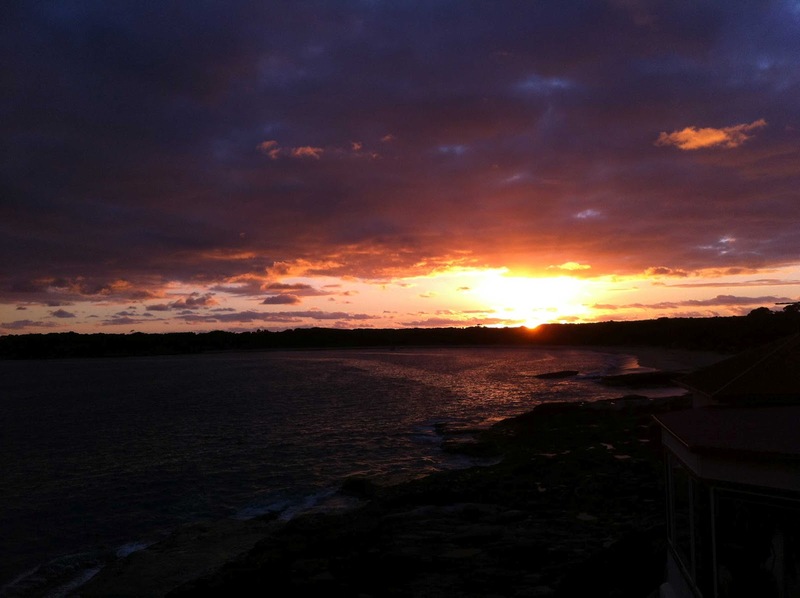 Beautiful post~~the photos are like a vacation in your far away land! No wonder people love it.....so much to see and so exotic. Glad to see you back to the blog and hope all is well. OK, what is 'the gloaming'???? Never heard that before. The girls are just as beautiful as Eddie is handsome! What can I say - you have adorable grandchildren - Basil included! YIKES - that lizard looks fierce! Thanks for another beautiful post! Thanks for the mention Carol, and especially glad you like my little gift. Your post is fascinating and I'm very impressed by your tracking abilities!! 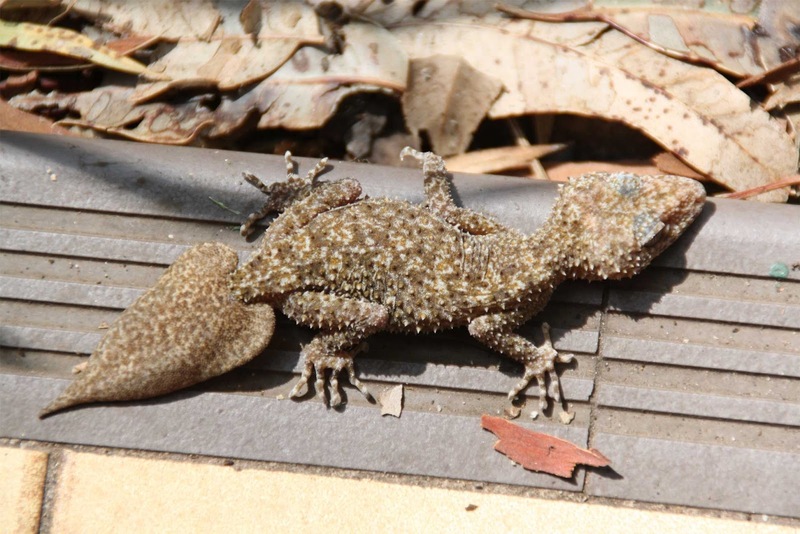 I've never seen that lizard before - I understand the camouflage benefits, but it must be a bit slow and awkward dragging that tail around. 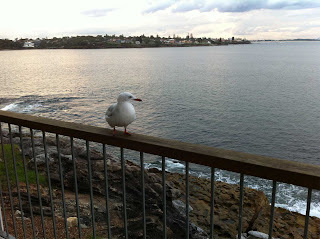 I feel sorry for that footless seagull - I wonder what happened? Or perhaps he was born that way and he knows no different. I hope so! No wonder you love this place. 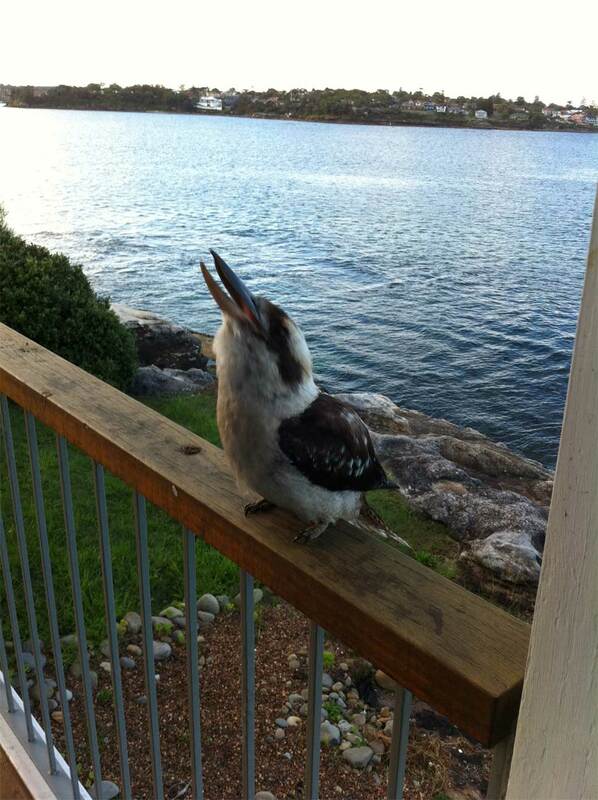 Beautiful views of the bay and the Kookaburra won my heart immediately. Thanks so much for your kind comments on my blog post celebrating The Pulse of Mixed Media. So glad to meet you and what a treat to see your over the top photos. 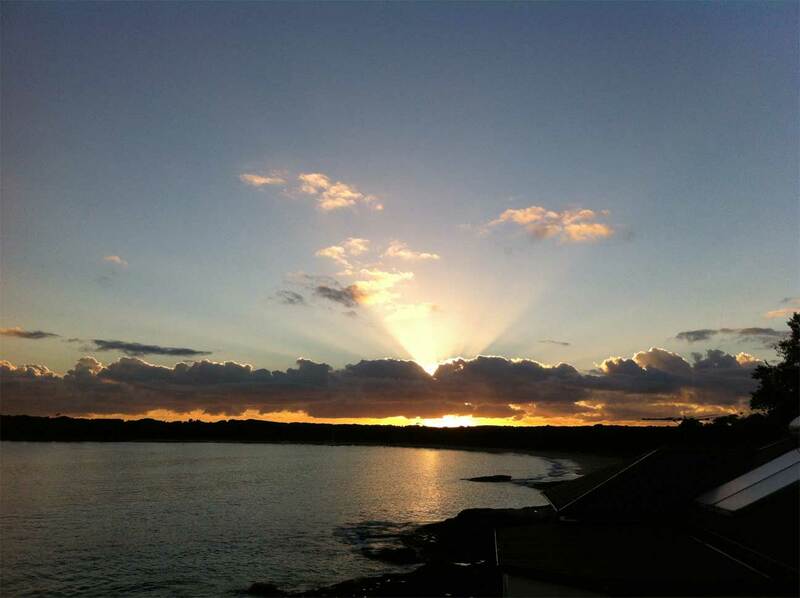 The sun shots above the water are exquisite! What a wonderful stay you've showcased. 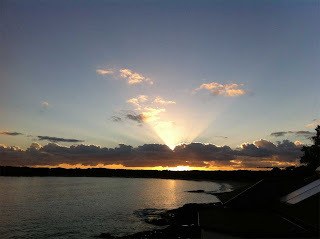 I'm a new follower of yours and will definitely be back to view your work! Hope you get to see all of the talented artists on the 31/31 tour!! It was wonderful to meet you at the Gunning Show, Carol. That gecko is amazing. I have never seen anything like it. I also adore lizards, hissing and biting included! I'm that person who stops ten times between Gunning and Canberra to move every shingleback skink off of the road and to safety.